Technology is on the rise and is resulting in more stable and robust platforms and software solutions. Such is the case with Cloud environment. Back in the days, having a server hosted on the cloud was meant to store server data on a virtualized platform which can be accessed at any time, as per user requirement. The idea of moving data into the cloud was to have more storage space in a much secure environment. However, in time, the idea expanded and more novel classifications of the cloud environment emerged. Private cloud is one such classification which came as a necessity of securing potential information in more controlled cloud environments. The purpose was to give more compelling benefits through improved security and increased flexibility in order to eliminate complications surrounding server management. Hence, organizations were seen investing their time, effort and cost in order to gain more customized solution for their respective businesses. 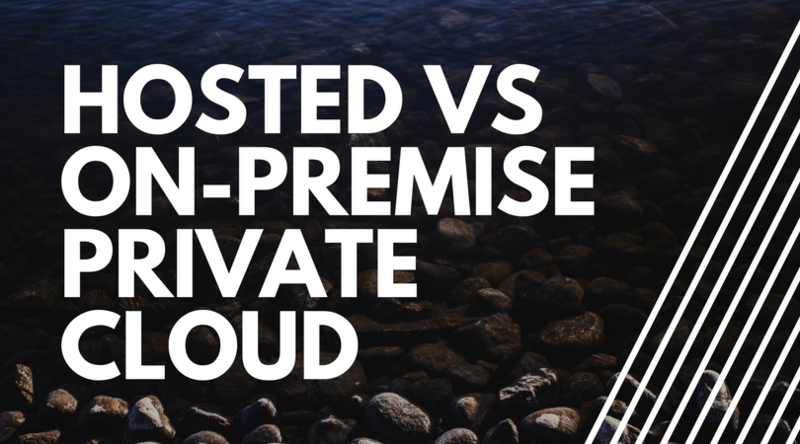 Allow me to discuss both types of private cloud solutions in brief so you can understand which solution may work best for your individualistic or organizational need. If you need to understand what a private cloud is before getting started, make sure to check out our article about Cloud 101: What is a private cloud. If not, let’s begin. Today, when you search up on Google what are your best options to create the best Cloud environment for your business, you are provided with a list of managed cloud hosting solutions. These are hosted private cloud solutions. Basically, most of these cloud providers offer you cloud servers in their own data centres. In case of a hosted private cloud solution, security management is the responsibility of the mediating third party solution provider. With an on-premise cloud infrastructure, you need to invest in security and control practices. Also, you get additional resources, high demand scalability options, user-friendly dashboard and a good support team to assist in server management. The best part is that you can avail all on-premise private cloud services along with a few extra more at a hosted cloud service provider for a much meagre cost. You will not only save your expenses, but you will save on cost incurred to purchase hardware resources, labour costs and other maintenance costs as well. While privately hosted clouds are located at an offshore location, an on-premise cloud will provide you with the option to host a cloud environment internally. Such cloud solutions require an internal data centre to host your cloud server. They are perceived to be more protected because firstly; they are in-house and secondly; they are manned by the organization’s IT department. One of the leading benefits of an on-premise cloud solution is that you get a complete control on aspects of security, scalability and configurability of your servers. However, you are limited to the option of scalability depending on the size of your data centre. With an on-premise cloud solution, you are capable to provide other SMBs to create instances within your respective data centre, so they can host their websites on your managed servers. Also, you have the liberty to add/remove as many additional resources and services as you want. If you have the right experts, you can create the best cloud environment for yourself. On-premise clouds give you more leverage and control on your server; however, with deploying one you need to take full responsibility for costs and maintenance. You should be ready to incur hardware resource costs, software licensing cost and be prepared for hardware failures. Also, you should be prepared to bear expenses for any additional resources to keep your cloud up to date and compatible with modern applications. However, in case of a hosted private cloud solution, you get a better result. You can access all server utilities without any hardware costs, software licensing costs or additional maintenance charges. No more hardware failures or website downtime, the best part is that the scalability of your website is unlimited. Now scale as much as you want, irrespective of the type of website you are building. It is a one size fit for all. VEXXHOST is currently offering free 30-minute consultation for companies interested in a private cloud. Get your free consultation by following the link below.